The Fall 2010 Whiting-Turner Business and Entrepreneurial Lecture Series kicks off this Thursday with a lecture by former UM president and Glenn L. Martin Institute Professor of Engineering C. D. (Dan) Mote, Jr. His lecture is titled "Nurturing Innovation for Problems Big and Small." U.S. Senator Ted Kaufman (D-Del. 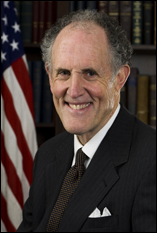 ), the only engineer in the Senate, will deliver the next Whiting-Turner lecture on Thursday, November 11. His lecture is titled "How an Engineer Became a Senator." Both lectures take place at 5 p.m. in the Kim Engineering Building lecture hall (Room 1110) and will be preceded by a reception starting at 4:30 p.m. outside of the lecture hall.